Three hours from Bangkok (average traffic) and a 20 minute ferry ride lies an unexpected paradise. 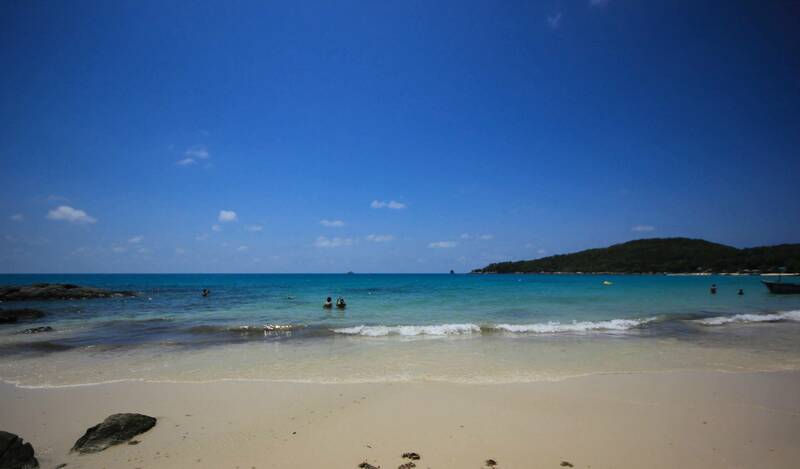 Ko Samet (Samed) has an abundance of white sandy beaches, crystal clear waters and vast areas of exotic coral. There is also a plethora of cuisine and nightlife on offer for both tourists and Thai locals. If you live in Bangkok, or are visiting the City, it is well worth taking a trip to Ko Samet. You’ve probably never even heard of it, but trust us when we say a trip is worthwhile! So why haven’t you heard of Ko Samet? It’s already a popular destination for those that want to get away from the hustle and bustle of Bangkok. And being so close to the capital, means you don’t have to endure the hassle or cost of having to get on a plane and fly. Furthermore, it’s less developed than island hotspots such as Ko Samui or Ko Chang. Much of Ko Samet is part of the Khao Laem Ya-Mu Ko Samet National Park. There is a small entrance fee to get in which is put towards the upkeep of the island. Currently, Thai nationals pay 40THB for adults and 20THB for children. Foreigners pay 200THB for adults and 100THB for children (Current as of July 2016). From Bangkok, you can either get a bus or a taxi to Rayong or Ban Phe. From here, you can take the ferry to Ko Samet. A bus will take approximately 3.5 hours and will cost just 200 baht approximately. The main spots to get the bus in Bangkok are Ekkamai, Mo Chit, Victory Monument, and Sai Tai Mai. Regular travellers will know that some drivers of the buses can be erratic, and although most are safe, some people would prefer to have the piece of mind albeit at an extra cost, of hiring a taxi. A taxi from Bangkok to Ko Samet will cost in the region of 1500 baht. This cost, when shared is very reasonable and can cut some of the hassle and time of travelling to Ko Samet. Ko Samet is the perfect place to enjoy wonderful white sandy beaches, and an array of restaurants and nightlife. There is also a wide choice of water sports available. Being totally honest, there isn’t a lot else to explore apart from that, but that is part of Ko Samet’s unspoilt beauty in comparison to some of the more popular island retreats. Ko Samet is ideal for a short break away from the hustle and bustle of city life. You will have plenty to keep you occupied in that time.